It’s Farro! 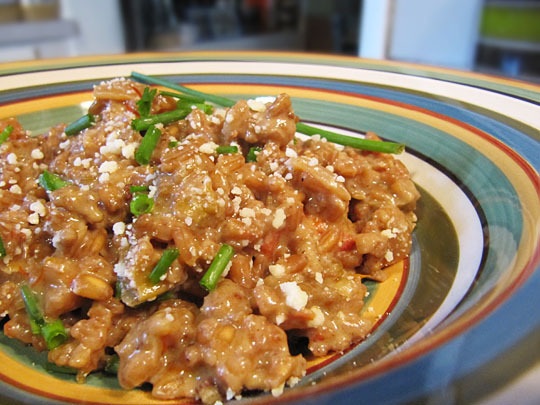 Farro is a type of wheat (grown mostly in Italy), that is like a spelt, but should be soaked before cooking. 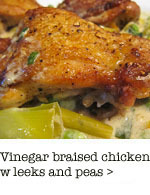 After cooking, it retains a nice, chewy texture. 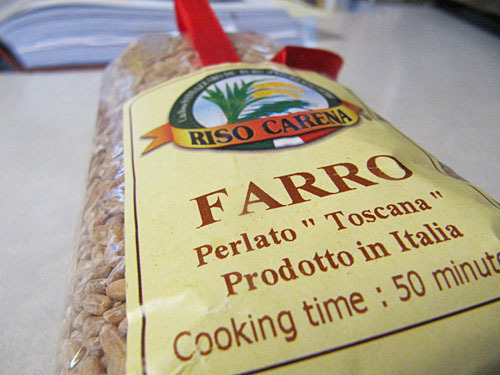 You can do a lot of fun things with it like make salads, add it to soups and use it for risotto — farrotto! 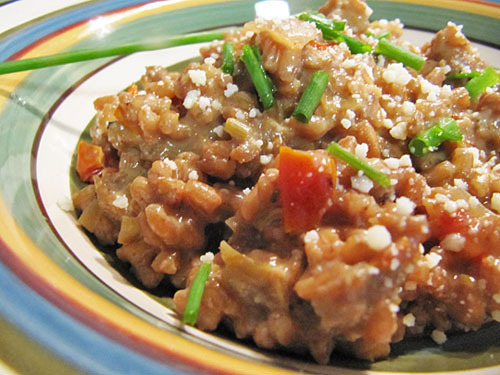 This is made pretty much exactly like a risotto, you just have to soak the farro first. The original recipe stirred in some butter at the end, but I used goat cheese. 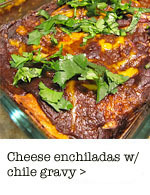 Because, why use butter when you can use cheese? This could also totally be made without the sausage if you wanted to keep it vegetarian (and use vegetable broth, of course). Maybe add some chopped bell pepper or something. Go crazy. 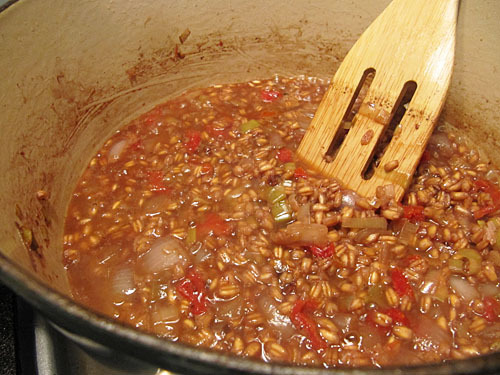 Place the farro in a bowl, add 3/4 cup boiling water and set aside about 1 hour, until water is absorbed. 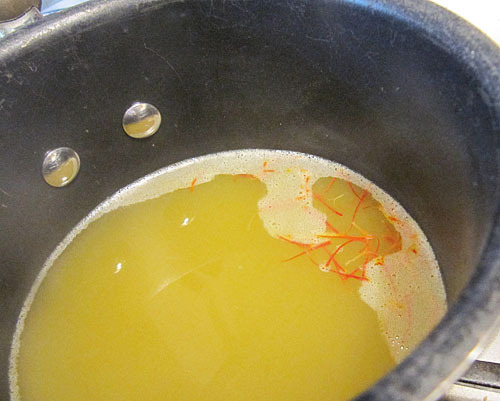 Place the stock in a saucepan, bring to a simmer, add the saffron and remove from heat. Heat the oil in a 3-quart saucepan. Add the sausage and brown, breaking up as it cooks. Remove and set aside. 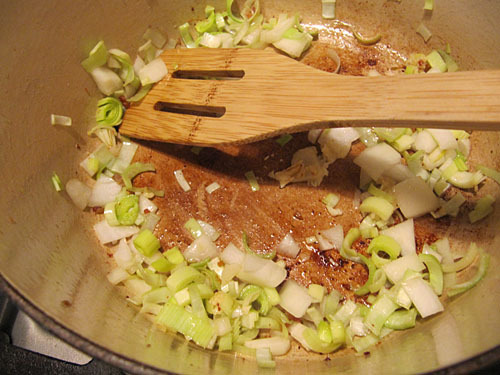 To the saucepan, add the leek and garlic and sautÃ© on low until they are soft. Stir in the fennel seeds and sun-dried tomatoes. 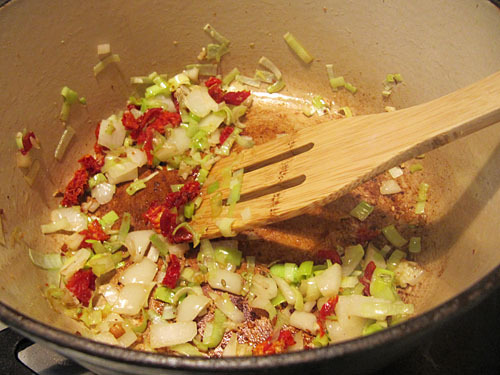 When the farro has absorbed the water, add it to the pan with the leeks and tomatoes. Cook, stirring, on medium, about 2 minutes. Stir in the wine and cook until it evaporates. 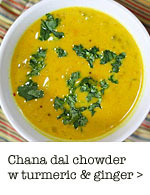 Start adding stock, about 3/4 cup at a time, stirring on medium-low, and adding more as the liquid is absorbed. Stir from time to time, not constantly. 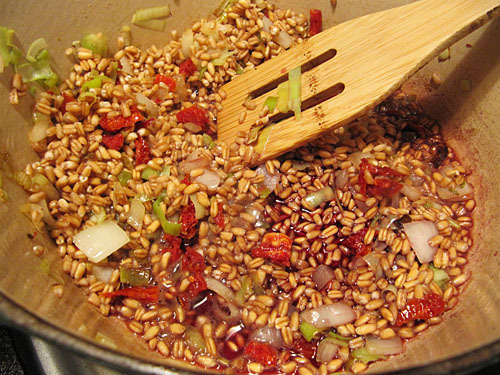 After about 35-45 minutes all the stock should be used and the farro should be al dente, with some grains just starting to break. Add the sausage back to the pot and stir to mix it in. Add the goat cheese and when it melts, remove the pan from the heat, and stir in about 2/3’s of the Parmesan. 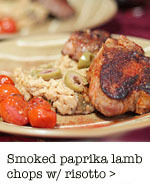 Taste and season with salt and pepper and garnish with some chopped chives or fresh parsley. Serve, sprinkled with the remaining cheese. 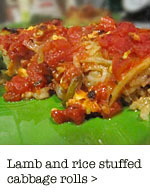 Edited to add: Upon having this for lunch the next day, the flavors and smell really remind me of paella. I’m sure it’s the grain-saffron-tomato combination, but it’s weird how that familiar (and delicious) flavor really developed overnight!